The BSopt project will deliver an integrated methodology for inter-organizational systems spanning from business models over business process models to their execution in a service-oriented architecture (SOA). 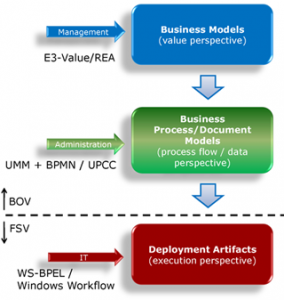 Integrating business processes into a SOA is certainly a hot topic. However, most current approaches are limited to the technical process aspects, disregarding the economic drivers of the information society. In contrary, BSopt will consider the formalization of the semantics of new business models due to faster changing business environments, their support by appropriate business processes and their implementation in flexible architectures. We will incorporate state-of-the-art approaches to describe business models, business process models and deployment artifacts in SOAs. However, we will go beyond the state-of-the-art by connecting the dots between these approaches allowing for a semi-automatic mapping between them. This will result in an integrated methodology spanning over all layers that is based on a meta model incorporating the semantics of the assimilated approaches. Furthermore, we demonstrate the customization of the BSopt approach by integrating a domain (= industry) specific ontology by means of the print media industry. A critical point in reaching user acceptance is tool support for the BSopt methodology. Following advanced software engineering concepts, we will implement the integrated BSopt approach as a software factory based on a so-called domain specific language (DSL). For this purpose we have to use a meta-modeling tool, that allows us to specify the BSopt meta model within this tool. Furthermore, the software factory will guide a modeler in a wizard-driven style through the BSopt methodology requiring not as much modeling know-how as in traditional modeling languages such as UML. The meta-modeling tools being used in BSopt are the Microsoft DSL tools for Visual Studio and ADONIS. The goal of a software factory-based approach is creating high quality code in shorter time. Code created by the BSopt tools are deployment artifacts (BPEL, WSDL, XAML,etc..) to be consumed by existing software environments – in our case the Oracle SOA Suite and the Microsoft Workflow Foundation. The BSopt approach will be validated by case studies in the print media industry.